We all remember the intense, national campaign in 2009 to deal with the H1N1 flu virus that was touted as an impending epidemic. Just over 400 people died from the virus that year. Serious enough, but consider this: some 75,000 Canadians died that same year from cancer and about 170,000 contracted it for the first time. It is predicted that nearly half of all males and four in ten females will eventually contract cancer while one of four of us will ultimately die from it. Not promising odds, most would say. Yet we seem to be complacent, accepting cancer as an unwanted, but somehow inevitable part of living. While those of us without cancer can choose to ignore it, those with it can often think of nothing else. For they face difficult life decisions, brutal treatment options, a lifelong fear of a recurrence, and a compromised future. A cure, once promised by US President Richard Nixon in 1971, is still nowhere in sight. Is getting cancer inevitable, just a case of bad luck? We believe that most cancer can be prevented and like many other experts around the world, we see potential prevention rates as much as 80% and higher. Why don’t we do more to prevent it? Cancer treatment and the quest for a cure can be more exciting and glamorous than promoting preventive measures. These are certainly more rewarding, financially. To pick up on that last point and to be blunt, it may be all about the money. By far, most money is spent on treatment. There is little spent on prevention and little dollar profit in it. We have some bold plans to change that. Cancer is a process whereby human cells start to multiply out of control. This leads to malignant tumours and other body function breakdowns that can, though not always, lead to premature death. There are definitive causes for that to happen – and very little of it is inherited. There is solid research that states that less than 5% of cancers are caused by inherited factors. On a very promising note, much is becoming known about preventing cancer and much can be done to not only prevent cancer but to improve our health, our happiness and our productivity. Furthermore we can save ourselves and our country a lot of money at the same time. One of the most exciting projects is starting up in Ottawa. It’s a public lecture series that explains what people can do to prevent cancer and what we can do together, to prevent cancer in our communities and across Canada. Our presentation distills the research out there to basic, credible messages that participants can take home to, as our name tells it, “Prevent Cancer Now”. The presentation, “Prevention Is The Cure”, is currently available in the Ottawa area for community groups, workplaces, schools, universities and colleges, churches – anywhere where people meet. Some doctors are already asking to see and hear it. The presentation is free but the take home message may be priceless for those who attend and their families and friends. It may save lives. Anyone can contact us to line up a presentation for their organization or group, or to find out where one is planned. Stand up, open your eyes, and like us, demand that governments and businesses make cancer prevention a priority in this country. 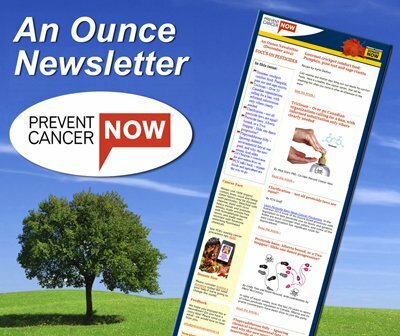 There are more cancer prevention tips and other resources available on our web site. There is much to be done collectively. At the community/national level, PCN wants to get corporations, institutions, and governments to take steps to dramatically reduce the environmental contaminants in our air, our food, and our water that can cause cancer. More than anything, cancer is an environmental disease. As one specific demand, we want to see a major increase in the effort to prevent cancer (less than 2% of all publicly-funded cancer research is dedicated to primary prevention, as opposed to early detection, treatment and support). We should not accept cancer rates as they are today and we must not accept the disease and its sufferers as simply collateral damage as our society moves forward toward vague, economic goals. The only way cancer will ever be beaten is to prevent it!